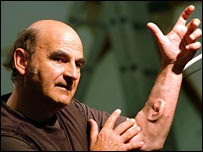 Stelios Arcadiou (aka Stelarc) is an "artist" who is known for his artistic idiosyncrasies. His performances often use robotics integrated with his body. For example, in 25 performances he hung himself on a flesh hook with robotics attached. Another time, he attached muscle stimulating electrodes to himself and allowed his body to be controlled via the internet. Now, Arcadiou has a new idiosyncrasy: a third ear that has been attached to his right forearm. The ear was not donated. Rather, it was created in a lab from cells and cartilage. The ear, of course, is not functional. However, Arcadiou hopes to have a microphone implanted in it so that others can listen to what his ear picks up. Some doctors have ethical issues with this procedure, but Arcadiou turns a deaf ear to them. .. and this is in addition to the mouth he already has on his backside. the purpose? Well, undoubtedly he would say that it is "art." BUT "art" is in the errrrr, um, ear of the beholder. of course, the better answer is that he probably did it for the publicity it brought to him. Face it, disfiguring yourself is always a good attention-getter... especially for an artist. Who knows? maybe he thought he was doing a reverse Van Gogh thing.